1 12 / the tasting panel / march 2014 MAVERICK MIXOLOGY W ith the 2014 World Cup taking place in Brazil this summer, it's safe to say things will get hot and spicy—and not just for those dancing the samba! Helping us enjoy that Brazilian ﬂavor and culture is VeeV Açaí Spirit and funkin cocktails, who have teamed up to deliver specially crafted Brazilian-inﬂuenced cocktails to enjoy during the heat of competition. 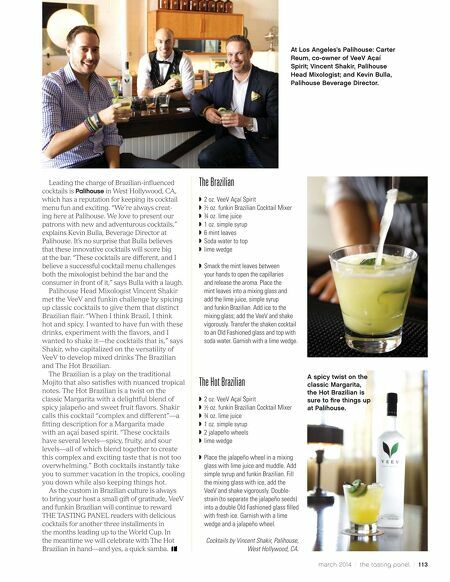 "Adding a distinguishable Brazilian twist to cocktails is as challenging and fun as soccer itself. It's an exciting way to bring Brazil closer to home," declares Carter Reum, founder of VeeV Spirits. "Being a huge fan of soccer and having played in college, my brother [Courtney Reum] and I thought this was the perfect opportunity to showcase VeeV and also have some fun!" 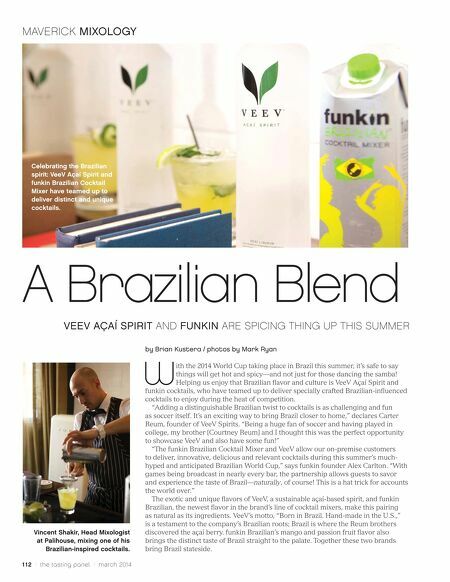 "The funkin Brazilian Cocktail Mixer and VeeV allow our on-premise customers to deliver, innovative, delicious and relevant cocktails during this summer's much- hyped and anticipated Brazilian World Cup," says funkin founder Alex Carlton. "With games being broadcast in nearly every bar, the partnership allows guests to savor and experience the taste of Brazil—naturally, of course! This is a hat trick for accounts the world over." The exotic and unique ﬂavors of VeeV, a sustainable açaí-based spirit, and funkin Brazilian, the newest ﬂavor in the brand's line of cocktail mixers, make this pairing as natural as its ingredients. VeeV's motto, "Born in Brazil. Hand-made in the U.S.," is a testament to the company's Brazilian roots; Brazil is where the Reum brothers discovered the açaí berry. funkin Brazilian's mango and passion fruit ﬂavor also brings the distinct taste of Brazil straight to the palate. Together these two brands bring Brazil stateside. A Brazilian Blend VEEV AÇAÍ SPIRIT AND FUNKIN ARE SPICING THING UP THIS SUMMER by Brian Kustera / photos by Mark Ryan Vincent Shakir, Head Mixologist at Palihouse, mixing one of his Brazilian-inspired cocktails. Celebrating the Brazilian spirit: VeeV Açaí Spirit and funkin Brazilian Cocktail Mixer have teamed up to deliver distinct and unique cocktails.